For a listing of other previous Retail Watch stories, please see our Retail Watch Archive. STAMFORD, Conn. — Sales and marketing powerhouse Norseland Inc. has had a banner year. 2006 marks the 50th anniversary of Jarlsberg cheese and the 125th anniversary of Tine B.A./Norwegian Dairies, Oslo, Norway, Norseland’s parent company. The company also recently was awarded first prize in the Great Jarlsberg Challenge sponsored by Tine, reflecting Norseland’s top sales of the cheese. In fact, Norseland has sold more of its Jarlsberg and Boursin cheeses in the past year than in the history of either cheese. It is the exclusive importer and sales and marketing agent for Jarlsberg, as well as for Tine cheeses Ski Queen Gjetost, Snofrisk and Ridder. The company also sells Laura Chenel Select brands. But as Norseland President and CEO John Sullivan will tell you, the company is just getting started. In the early 19th century, Norwegian cheesemakers attempted to produce a domestic version of the popular Emmenthaler cheese from Switzerland. As with many cheesemakers from other countries, these efforts produced a slightly different product. Adding to these efforts in the 1950s, the University of Agriculture in Norway conducted developmental research on a semi-soft, part-skim cheese with eye formation. Professor Ole M. Ystgaard is credited with developing the bacteria cultures and manufacturing techniques used to process the cheese. This new cheese was named after Count Vadel Jarlsberg, whose estate was on the Oslo Fjord near where it was manufactured. The name later was registered as a trademark around the world, and the cheese was introduced to the United States in 1965. 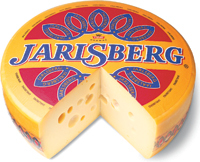 Jarlsberg has the distinction of being both a brand and a type of cheese, meaning any Jarlsberg cheese a consumer purchases will have been made under the direction of Tine. During the last quarter century, the cheese made quick gains in popularity and began bumping up against its import quotas. So in 2000, commercial production of Jarlsberg began “somewhere in Ohio,” Sullivan says, declining to be more specific. The plant produces Jarlsberg and Jarlsberg Lite, a 50 percent reduced-fat cheese with 30 percent fewer calories than regular Jarlsberg, for the company. Both the regular and lite versions of the cheese come in slices, including a new Deli Thin Sliced, 8-ounce, exact-weight shingle pack, which was launched in October. The goal is to have the imported wheels from Norway make up all of the quota and for the sliced cheese to be produced in the United States, Sullivan says. The sliced cheese category is growing very quickly for Norseland, he adds. Tine also has begun commercial production of Jarlsberg in Ireland which will support the brand’s future growth in the United States, Sullivan notes. Jarlsberg cheese is the No. 1-selling brand of specialty cheese in the United States, Norseland officials say. The cheese has 90 percent national distribution in 32,000 supermarkets that have sales of more than $2 million each year. The nationally-advertised brand has a high brand awareness level of 58 percent among consumers, Sullivan notes, which helps it compete with other specialty cheeses at the point of purchase. Sullivan is careful to note that Norseland knows Jarlsberg isn’t on most shoppers’ grocery lists, so being able to stand out in the specialty cheese case is crucial to Jarlsberg’s success. Norseland officials work diligently behind the scenes to ensure the company’s products get great placement in the retail case by developing close relationships with the retailers and brokers who decide how to handle the cheese. That support includes a significant budget for promoting the company’s products to retailers and distributors, he notes. Norseland even has offered prizes to brokers who sell the most Jarlsberg or Boursin. Last year, the company gave away a cruise to the broker who most increased sales of the cheese during the April 1-July 15 promotion period honoring the cheese’s 50th anniversary. In addition, Norseland had a consumer event offering a cruise to a lucky Jarlsberg devotee. Of course, the company also is directly targeting marketing messages to consumers. In the past year, Norseland has placed consumer advertising in Women’s Health, Weight Watchers, U.S. News and World Report and Everyday with Rachel Ray publications. The ads include the tagline “Jarlsberg makes it special” and feature new uses for Jarlsberg and Jarlsberg Lite (on salads, as part of brunch meals, at dinner parties, on “Jarlsbergers”) as well as encouraging consumers to reward themselves with Jarlsberg. The company also runs television commercials on The Food Network and other outlets. With Jarlsberg sales going strong, Norseland officials decided they wanted to take on support of another brand. They needed permission from Tine first, however, and it wasn’t a given that the company would allow Norseland to proceed. “Tine worried that we might lose our focus on Jarlsberg by adding another brand,” Sullivan says. But Norseland officials were able to convince the board and today, Norseland enjoys many efficiencies under the new arrangement. The company has been representing Unilever’s Boursin brand since 1993, and has grown its sales nearly 10 times over. Now Norseland offers more flavors of Boursin, both annually and seasonally, including Garlic & Fine Herbs; Lite Garlic & Fine Herbs; Pepper; Fig, Raisin & Nut; Shallot & Chive; and Cranberry & Pepper. At the recent SIAL food show in Paris, Norseland was awarded Unilever’s global award for the strongest “Passion for Growth” of Boursin. “We are extremely proud of this honor and motivated to continue the growth of the Boursin brand for Unilever in the years to come,” Sullivan says. Finally, the company is launching its first range extension of the line: Boursin Toppers. Boursin Toppers are mini, bite-sized Boursin cheeses that Norseland is promoting for use as salad toppings and for holiday entertaining. Each cheese is approximately the size of a nickel and slightly barrel-shaped — perfect for serving with a toothpick for an easy, elegant appetizer, company officials say. 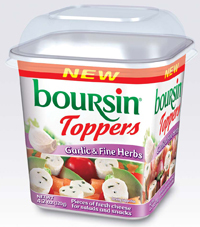 Boursin Toppers come in 4.2-ounce packages of Garlic & Fine Herbs and Green & Black Olives flavors. The product currently is being introduced in select markets. The secret to the company’s success is twofold, according to Sullivan: an expert understanding of consumers through research and the willingness to spend aggressively against that research. “We look at the core consumer and try to find a way to get that person to use the product more,” Sullivan says. Then the company works to expand the product’s appeal among new customers, he says. For instance, the company recently made its Jarlsberg slices thinner in response to observing consumer reactions to the cheese. “We’re constantly retooling,” Sullivan says. In fact, in the coming year, Norseland will begin representing products in several new categories — “large dollar categories,” Sullivan notes. “In these categories, you don’t need to have a tremendous market share in order to make a successful contribution to the bottom line,” he adds.